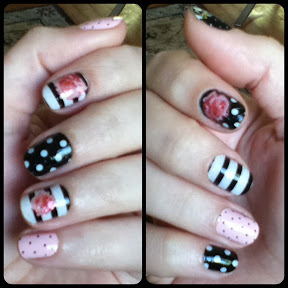 I am a huge fan of the nail polish strip fad. Instant fancy nails? No drying time? YES! I've noticed that Claire's carried them, but I've been more than happy with the Sally Hansen ones, and after the awful results from the Sephora version, I've been hesitant. However! 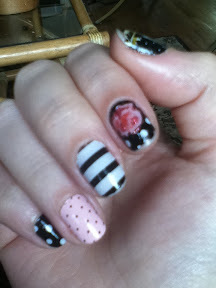 I gave in when they released a design of polka dots, stripes, roses, mixed and all in one pack. I liked the idea of having mixed-print nails, so I took the plunge. So firstly, the price and packaging: they run about 9.75$ Canadian, and come in a cute zip-lock bag with a cute nail file (which of course, I forgot to take a picture of). The product itself: unlike the SH ones, these come in a sort of "sticker sheet". They were really hard to get off and onto my nail without tearing them. I ruined a few in the process. Luckily, you get 20 strips. They were also really thin, which made it hard to get them on smoothly without any creases. They didn't end up looking bad, as you can see from the above picture. Two days later: the strips are bubbling and peeling, the edges are chipping off. I ended up taking them off because they looked so bad. I followed all instructions to a T (including adding a top coat). I think these are fine if you just want cute nails for a day (maybe a special event? ), otherwise I wouldn't bother. I don't think I'll be purchasing them again. They are better than the Sephora ones for certain, but the overall cons outweigh the pros in this case.